Four Good Things! Beer. Puppies. Explosions. Art! The Blast Factory is pleased to announce that Stick Vega is teaming up with Ale Asylum and The Waypoint Public House for an evening art show and beer event dedicated to the Dane County Humane Society. The event will be March 8th, 2017, from 5 to 8 PM. Explosion art demo at 7 PM. The Blast Factory will donate 50% of any art sales, and Waypoint is donating 10% of the day's sales to DCHS. Ale Asylum is bringing some fantastic, cool beer! Stick Vega said, "Please join us. 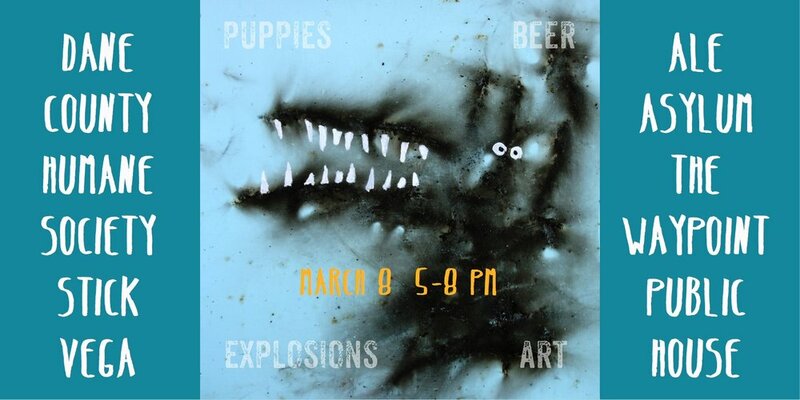 There are four good things: Beer, puppies, explosions, and modern art. And, this event is approved by Archie, The Blast Factory Sheltie!"